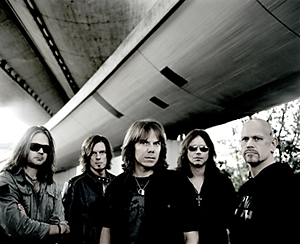 Made up of all five original members – singer Joey Tempest, guitarist John Norum, keyboardist Mic Michaeli, bassist John Levin, and drummer Ian Haugland, Europe took a thirteen year break before regrouping in 2004. 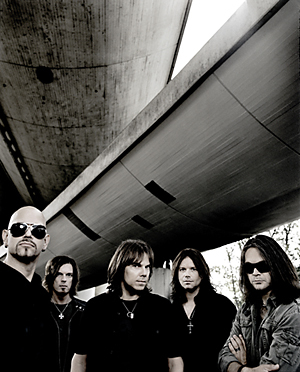 Though Start From The Dark wasn’t widely experienced in the United States, Secret Society, released in November 2006, is a solid hard rock album in a modern style that bears little resemblance to the band of yesterday. It features the original band members, but rather than rehashing yesterday’s sound hoping for a mid-career “comeback” like many other artists from the ‘80s, the musicians in Europe continued to evolve during their years apart. “It’s a much bigger freedom these days. We do whatever we want to do. MPc: I saw a photo of you with the 335 on the Europe web site and was surprised to see you playing a guitar like that! Yeah. In the old days, we just used standard tuning, A 440, you know. We didn’t really know about those tunings. The first time I heard drop D tuning was Van Halen’s “Unchained” and I was like “What is that? That’s really cool!” But we were just doing standard tuning back then. We started experimenting with that on the Start From The Dark album which came out about two years ago. Secret Society cover art by legend Storm Thorgerson.